My next read for R.I.P. IX. Thanks, Delia, for the recommendation. I loved the book. He started as a ﬁre brand seemed to burst forth from nowhere. He saw it moving in the darkness like a ﬂaming insect. Then the bonﬁre was ignited and its stacked wood ﬂamed up with a crackling roar. Now he could see the Apaches gathered in a giant circle around the mounting ﬁre, all of them seated cross- legged, their faces reﬂecting the ﬂames like burnished oak, their dark eyes glowing as they stared at the ﬁre. Who were they? he wondered. What were they thinking? Once again, he felt completely foreign to the moment, trapped in some unearthly vision. Summary: Southwest Arizona, a century ago. An uneasy true exists between the remote frontier community of Picture City and the neighboring Apaches. That delicate peace is shredded when the bodies of two white men are found hideously mutilated. The angry townspeople are certain the “savages” have broken the treaty, but Billjohn Finley, the local Indian agent, fears that darker, more unholy forces may be at work. There’s a tall, dark stranger in town, who rode in wearing the dead men’s clothes. A stranger, who is incredibly strong, looks neither white nor Injun, who has a scar around his neck, a stranger who may not be entirely human. My thoughts: I've always felt that all horror works on suspense, not knowing what comes next, not being able to understand what happens; that causes fear. 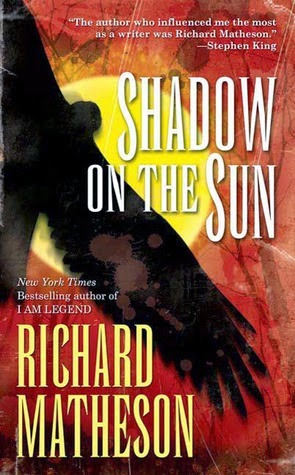 Shadow on the Sun by Richard Matheson shows the difference between suspense and intrigue. The plot of this western, as you can see, is fairly straightforward. About six pages in, and with one glance at that first cover, you can guess what should have been the biggest mystery of all – what mauled the two young men and how is it related to that strange man with the scar around his neck? But that’s the thing about this book. Knowing who is behind the killings, knowing how a man is able to brutally mangle his victims, the knowledge that the crux of the mystery lies in Native American mythology doesn't make the story any less scary. Suspense - uncertainty of fact - is one quality of horror. If wielded effectively, intrigue is a much better tool. You have all the answers you could ask for and yet, every time the stranger steps onto the page with his scornful smile you find yourself shuddering. Shadow on the Sun is about a clash of cultures. About the suspicion with which we view every new thing, the evil inhuman intentions, the capacity to swiftly lay blame, the misplaced high mindedness that lies at the heart of every colonization. That the young Harvard graduate officer Boutelle, or the vengeful brother of the two victims believe the murders are the work of the savage Indians shows a terrible conviction that humans are capable of every bit as much horror as a supernatural demon. It makes you wonder how we think so little of ourselves. The stranger, the tall large man with the scar around his neck, from his physical description and his alienated behaviour, his desperation, his unthinking ruthlessness, is reminiscent of Frankenstein's monster. The fact that he's looking for a Night Doctor only strengthens the impression. Whether he carries the blame for what he was turned into is not a question to address in this story, but the likeness could not be unintentional. The thing that makes this book special, like the other two I've read by Matheson, is the clean-cut precision of the story. It begins mid-action and ends on just the right note, leaving us to conjure up a suitable tying up of loose ends. The plot is crisp, the mood evocative, and every word seems deliberately chosen to make you shiver. A nice, short read by a great writer - recommended by Stephen King as the author who influenced him the most as a writer - what more could you want? What a great review! I'm so glad you loved the book, it was such an exciting adventure, wasn't it? I didn't make the Frankenstein connection but now that you mention this, I can see it. Frankenstein was a bit more eloquent though but just as scary. Sounds like an interesting premise. I don't really read westerns, but I'm a fan of Matheson from A Stir of Echoes. Delia - Of course, it doesn't come close to Frankenstein in that respect, but the element is there. The monster isn't Vandaih, but his son, who couldn't have helped his existence nor his resurrection, which is not his fault at all. Just thinking aloud. :) I can't wait to read the other books you recommended, maybe Rats next. Wow, this sounds pretty darn cool. Matheson's "I am Legend" is of course, a classic in its own right but I've never read anything else by him. 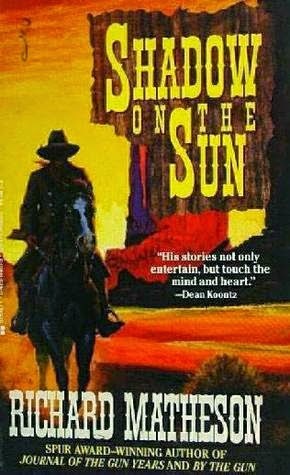 The western genre has always been a favorite of mine, especially the 'spaghetti westerns' in film, but I haven't read many westerns other than Lonesome Dove. I've add this to my list, thanks Priya.